Killing Time – Gun-Operated Alarm Clock | OhGizmo! I don’t think anyone’s come up with a more satisfying way to hit the snooze button than this. I know when that alarm wakes me up at 11:30 every morning it becomes enemy number one in my mind and I’d love to shove a gun into its beady little LCD display. 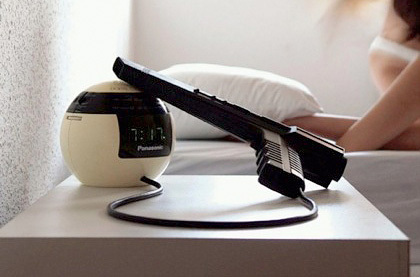 Designed by Roger Ibars the Gun-Operated Alarm Clock uses an old gaming light gun that has been retrofitted with a few tilt switches. So in addition to squeezing off a few rounds for some extra shut-eye in the morning the gun can also be angled and tilted to control other functions of the clock like setting the time and alarms. I made a similar device in my college days but used an actual Smith and Wesson instead. It was pretty effective at both silencing the alarm and getting me kicked out of the dorm. Unfortunately the Gun-Operated Alarm Clock falls under the ‘concepts’ category so you can put those credit cards away since you won’t be buying one any time soon. Pity its not for sale yet. That looks like a Panasonic branded alarm clock, yes? How about a clock , a calander and an ALARM on a bead side digital photo frame? ?